Jordan has announced that it will end the lease of land to Israel agreed in 1994. Rebel Voice wonders why Jordan gave the lease in the first place. Israel has never been a friend to Jordan. Is this another example of Zionist imperialism? Interestingly, the Israeli PM and war criminal, Benjamin Netanyahu, has stated that the rogue Zionist state will renegotiate the lease. He deliberately ignored the decision to end the contract in a clear sign of the disdain in which Israel holds its neighbours. Rebel Voicewonders if the Jordanian government will back down and do what their alleged Zionists masters tell them to? In the Oct. 26edition of False Flag Weekly News it was reported that law makers in Israel were considering a new statute that would criminalize BDS supporters including by subjecting them to heavy jail time. In our brief exchange on the story, Dr. Kevin Barrett and I considered the possibility that there would be efforts to project the same law to people outside Israel in the name of universal jurisdiction. Colleen McGuire took the discussion further by pointing to the fine of $18,000 imposed by an Israeli court in a civil action involving two BDS activists, women of both Palestinian and Jewish ancestry. Their letter persuaded New Zealand performer Lorde not to perform in Tel Aviv. The civil case was brought by a group with tickets to the concert who claim to have been traumatized by Lorde’s decision. Although there is not now any means for the Israeli court ruling to be enforced in Aotearoa (New Zealand) the ruling nevertheless moves the markers and sends a signal of where juridical trajectories are being pointed by powerful interests. The concept of universal jurisdiction is a two-edged sword for the Israeli government. On the one hand the advancement of the concept through the development of enforcement techniques poses threats that IDF and related Deep State operatives might be apprehended and tried outside Israel for international crimes committed inside Israel and the territories it controls. On the other hand, the application of the principles of universal jurisdiction might offer a means of exercising and expanding the imperial powers inherited from the old Anglo-American empire. In the Eichmann trial, the court in Israel set another important modern precedent in the advancement of universal jurisdiction. Nazi war criminal Adolf Eichmann had been apprehended in Argentina by Israeli intelligence agents and brought to trial in Israel. In a detailed opinion the court appealed to the idea of the natural law to find universal jurisdiction applied. It found the crime of “genocide against the Jewish people” to be unequivocally a crime against accepted international law. In Grotius’ vision of natural justice, it seems, some room was left for the principle that might makes right. International and transnational trade law is another important site of experimentation in the evolving concept of universal jurisdiction. As I see it, the primary role of the WTO created after the demise of the Soviet Union was to establish a single platform from which to charter global corporations not constrained by national borders and the sovereign jurisdiction of national governments. As it is now, corporations continue, in theory at least, to be subject to the authority of the sovereign national governments that created their charters thereby investing in them their legal capacities and personality. There are unmistakable anticipations of some edified form of Israeliocentric universal jurisdiction associated with the will to build in Jerusalem a Third Jewish Temple along with reconstituting a governing Sanhedrin. The universalist claims made by proponents of this religious agenda including Christian Zionists have profound geopolitical implications that figure into all sorts of issues including the future of the BDS movement. A (US) diplomat has told the Washington Post that, “the planning [for the withdrawal] is the brainchild of Trump’s hawkish national security adviser, John Bolton, [a career opponent of all arms control treaties on the principle that they potentially might limit America’s options to take unilateral action], has told US allies he believes the INF puts Washington in an “excessively weak position” against Russia “and more importantly China”. Filed under: American Hegemony, China, INF, NWO, Russia | Tagged: INF Treaty, NWO |	Comments Off on A Rules-Based Global Order or Rule-less US Global ‘Order’? Member of the PLO Executive Committee, and the DFLP’s Political Bureau, Tayseer Khaled in a statement on Wednesday saluted the Palestinian Jerusalemites, as they have boycotted the municipal elections in the occupied East Jerusalem, which he said emphasizes their solid position on the city despite all the maneuvers exerted by the Israel Government and the occupation Municipality in Jerusalem headed by Nir Barakt over the last months to break the boycott campaigns led by the PLO and other political, national and social organizations as well as the Islamic and Christian figures. Electors didn’t appear at the polling centers, and the electoral map showed that the percent of voting was drawing to zero as was the case over the last years. Khaled added that boycotting of the Israeli Municipal Elections Is a clear message to the American Administration, and the Israeli government on the Palestinians rejection of Trump’s recent recognition of Jerusalem as the capital of Israel and the transfer of the US Embassy from Tel Aviv to the occupied Holy City. 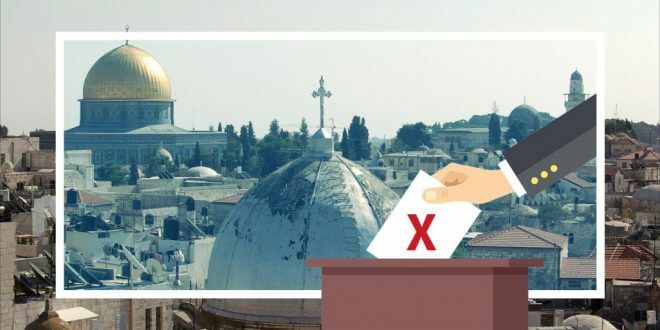 Boycotting the elections is a referendum on the rejection of the Israeli occupation of the city and that Jerusalem is an integral part of the Palestinian territories that was occupied in the June 1967’s aggression and affirmed the Palestinians’ attachment to Jerusalem being their eternal capital. Khaled renewed his call for unifying all the references in Jerusalem in a single national one as was agreed upon among the national forces, and the PLO’s parties and the Executive Committee. He reiterated his call for the Palestinian government to allocate sufficient and necessary budgets to the city, especially to the educational and health institutions. He called on the Arab sister and Islamic countries to cut their relations with those countries that recognize Jerusalem as the capital of the occupying State and/or intend to transfer their embassies to the city. He urged them to support the steadfastness of the Palestinian citizens in Jerusalem to enable them to defend the city of the Judaization, racial discrimination and ethnic cleansing practiced by the Israeli government in Jerusalem. Palestinians in Jerusalem have boycotted the Municipal elections on Tuesday since the municipality is affiliated to the Israeli government and works in pressuring the Palestinians in Jerusalem through implementing deportation and demolition orders, in addition to other anti-Palestinian regulations in Israel. The boycott also comes as a way to affirm an Arab Jerusalem, which is considered the eternal and historic capital of Palestine. Earlier today the world lost a distinguished insightful mind and I lost one of my best friends. Enzo Apicella, the greater than life, tireless cartoonist passed away in Rome this morning. Many of my followers had a lot of fun with our A to Zion – The Definitive Israeli Lexicon. The book of alphabetic satire was Enzo’s idea. Enzo saw in me an aphorism artist–that I could get at the truth with few words. He set me to work on a collection of hard-hitting definitions and he produced the relevant cartoons. As always, Enzo illustrated the truths that can’t be reduced into words. I met Enzo in 2011 and we stayed in close touch since then. Despite his age, Enzo was the liveliest person around. He knew how to enjoy life — wine, food, garlic and women were his existential mantra. And Enzo delivered, he never missed a day of producing one of his hard hitting cartoons, always in support of the weak and the oppressed, often in support of Palestinians, and critical of the English speaking empire. The world is crippled without Enzo Apicella. I am very sad this morning and I am certainly not alone.